Tired of having the wrong size girth on your saddle? The Just-A-Cinch is the sure fire way to eliminate the need for a tack room full of different girths. The Just-A-Cinch has a center strap adjustment that allows you to have a range of girth sizes from 42" to 54" (large) or 36" to 46" (small). 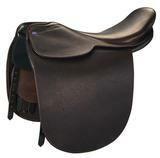 Constructed of high quality Wickett & Craig bridle leather with a nice soft liner that prevents chaffing. Stainless steel hardware throughout. Double elastic on both ends.